Labyrinth combines all the best elements of so many games I love and grew up with. It is, of course, a collectible card game where you can combine hundreds of cards to create limitless strategies. It is also a tactical RPG which combines the best elements of the world of miniatures gaming along with the fun of leveling up and improving your character over time. Labyrinth also provides the experience of being a Dungeon Master, creating a diabolical series of monsters and traps in an attempt to defeat the hapless heroes who dare enter your domain. Trying to make all of this function seemlessly inside of a rich and immersive world is no small task, but once I saw the amazing work of Chris, Bradley, and the rest of the Free Range Games team, I knew we could get it done. We are still in the midst of design work on the game, and one of the great things about being a part of a kickstarter is that backers can see the design process first hand, and their input can influence the direction of the game. For our kickstarted digital card game, Solforge, we are also working with Free Range to update our entire user interface and make changes to core systems like the game timer in response to backer and player input. It was that working relationship with Free Range and their commitment to quality and great games that reinforced my belief that we can accomplish a project as ambitious as Labyrinth. Though many of the mechanics are still in flux as we work on the game, I want to talk today about a major game mechanic that I am particularly proud of. One of the challenges of traditional turn based tactical games is the blandness of the turn structure. The classic “I go, you go” back and forth doesn’t allow for a lot of creativity and doesn’t do a great job of representing the different speeds of different characters in combat. A lumbering giant who swings a tree trunk for a weapon should not take the same number of turns as a nimble assassin. To solve this problem, we introduced a “tick” timing system into Labyrinth. In effect, each character has their own personal clock, that is spent to take actions. Quick actions will only cost a few “ticks” of time, but more powerful actions will cost more, forcing a character to wait longer before more actions can be taken. This system, combined with the drawing of cards from a character’s deck, creates a dynamic playfield that takes the best of real time gaming, but slows it down so you can play at your own pace and come up with an optimal strategy for each turn. For those of you who played the World of Warcraft miniatures game, you will recognize a similar mechanic. For years, I worked on developing and balancing the timing system for that game, and we were able to apply those learnings to our work on Labyrinth. In the physical world, tracking the timing system for each character was a bit of a pain and for 8 years I have wanted to bring the essence of that mechanic to life in a digital format. With your help, that wait can finally be over. 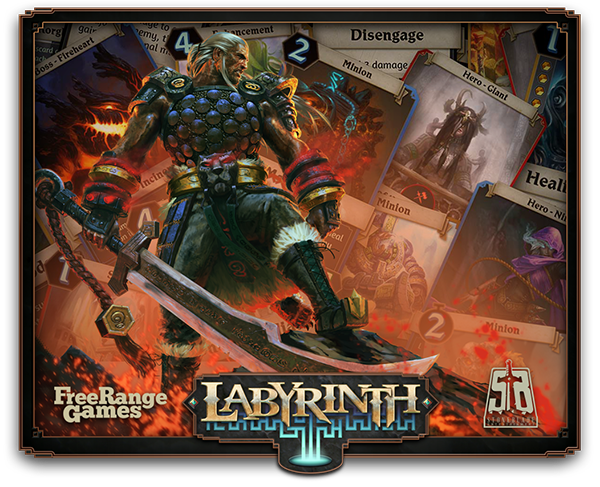 Though Labyrinth takes elements from so many of our favorite game genres, it is unlike anything you have seen before. The strategy that comes from building your party, preparing your dungeon for enemy player raids, and making the tick by tick decisions to win each round is deep and engaging, but the aysnchronous play and AI controlled monsters gives you the ability to play at your own pace and experience the classic dungeon crawl of a turn based RPG. This is going to be a fun ride and I encourage you to become a part of the experience. As of this posting, there are only 24 Hours left to bring this project to life! Check out Labyrinth on Kickstarter and lets bring this vision to life together.